Log Wizard is a chainsaw attachment that can transform your saw into a completely new tool. You can use the Log Wizard as a debarker, planer, notcher, and sharpener. Log Wizard comes standard with 3 ¼ inch blades and uses ball bearing construction, which gives it a long life and durability. So, is Log Wizard the right tool for you? What can the Log Wizard do? Debarking – one of the hardest things about converting a tree into usable wood is getting the bark off of it. This device does an excellent job of removing bark – fast -- so you get a smooth surface of wood within minutes. Planing – a planer cuts your piece of wood to the necessary level of thickness. If you have a specific use for a piece of wood that requires a particular level of thickness, Log Wizard will help you reach your desired specification. Notching -- if you want to create a notch or groove in a piece of wood for functional or stylistic reasons, Log Wizard will do the job. Sharpener – sharpen a piece of wood so that it’s pointed or curved. Who should use Log Wizard? Furniture builders – for those looking to develop beautiful pieces of wood for use in furniture, this device allows you to craft pieces of wood to create high-end décor. Farmers and ranchers – if you’re a farmer or rancher, you may have a lot of logs on your property. Log Wizard can help put the logs to use for other purposes. Wood craftsmen – obviously, any tool that helps you mold wood is perfect for a craftsman. This would be a versatile weapon for your arsenal. You will need a longer chain in order to the Log Wizard. Plan on purchasing a chain that is two inches longer than the bar you're using. For example, if you are using an 18-inch bar, you will need to use a 20-inch chain so that the chain can wrap around the Log Wizard. 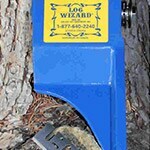 At Chain Saws Direct, we also carry Log Wizard replacement blades. Allowing you to properly maintain your machine and maximize it's debarking potential. If you would like to try another brand, the Timber Tuff™ Log / Bark Peeler is a similar product to Log Wizard. It can help you prep logs, and it uses standard planer blades for easy replacement. Log Wizard: Debark, Plane, Notch, and Sharpen Logs - Find Out How to Debark a Log with a Chainsaw Tool. Our chain saw how-to library can help you pick the perfect electric chain saw, gas chain saw, pole saw or chain saw accessory.